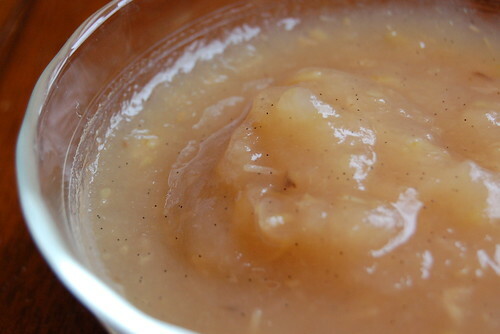 Homemade applesauce is one of those warm, hearty, comforting winter foods that is easy to make from scratch and infinitely better than any store-bought variety. I never cared much for the little plastic containers of Mott's I occasionally ate as a child, and even the organic jarred version my college co-op ordered was uninspiring. 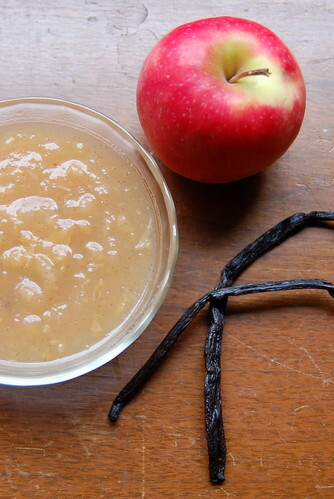 Real, homemade applesauce needs only one ingredient: apples. You can add other flavorings if you'd like: a cinnamon stick for additional spice is traditional and lovely, while a teaspoon of lemon juice yields a brighter, more tart version. Making applesauce is less a recipe than a technique. Throw in however many apples you have, add a bit of water and perhaps some flavoring, cook until soft, and mush. That's it. Conspicuously absent from my applesauce recipe is sugar. Start with decent apples and cook them long enough to caramelize the fruit's natural sugars, and you just don't need it. Cue: the applesauce pot. I had just put my apples on the stove and opened up my spice cabinet looking for a cinnamon stick. But smack-dab in front of me was my jar of vanilla beans, and something clicked. I pulled out one long, sweet, brown bean, split it lengthwise with a sharp paring knife, and scooped the thousands of little black seeds straight into my applesauce pot. Then I threw in the husk of the pod too--no reason not to, and steeping the entire bean adds an even stronger vanilla flavor. Thirty minutes later, my house smelled like warmth, comfort, and home. I tried a small, piping hot spoonful, flecked with tiny dark vanilla seeds suspended in the soft sauce. Fruity and earthy to be sure, but with an underlying floral taste from the vanilla that I hadn't enjoyed before. A softer, more elegant applesauce than the more common cinnamon-based version. It's perfect for January, when you're looking for a hint of sweetness and warmth but have had enough of the spicy holiday flavors associated with December. Make a pot of applesauce. Make it your own, however you'd like. But if I might offer up a small suggestion? Try a vanilla bean. You'll be glad you did. 1. Quarter and core the apples and cut them into chunks, 4-6 chunks per apple quarter. 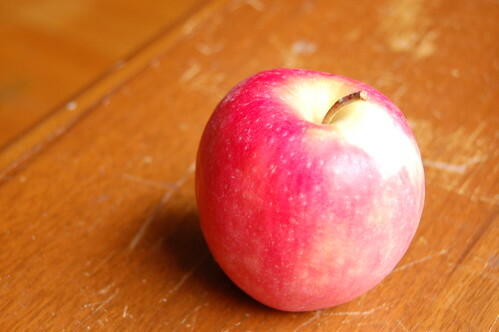 (I don't peel my apples because the skin adds flavor, color, and texture. But if you're looking for a perfectly smooth applesauce, either process through a food mill at the end or peel first.) Throw the apples into a pot and add about 1 inch of water. Halve a vanilla bean lengthwise, scrape out the seeds, and add both seeds and pod to the pot. 2. Simmer covered on medium-low for about 30 minutes, stirring occasionally, until the apples fall apart. Add a bit more water if the sauce is too thick or scorching on the bottom of the pot, or remove the lid and let the mixture reduce on medium heat if the sauce is too thin. If the applesauce isn't sweet enough, continue to cook until the sugars caramelize and the color changes from a pale to a deep golden. Check about every ten minutes, stirring and tasting, until it's right for you. 3. 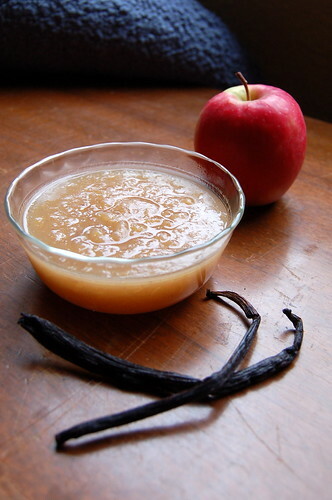 Remove the vanilla bean pods and mash your applesauce. You can beat the heck out of it with a whisk for a chunkier texture or blend with an immersion blender until mostly smooth. Process through a food mill for the smoothest texture, but I find this step time-consuming, dishes-generating, and unnecessary for a rustic-style sauce. 4. Eat warm straight out of the pot, or refrigerate leftovers and eat cold. Reheats nicely in the microwave. Yum! 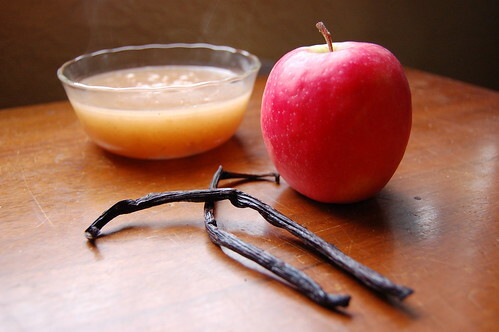 LOVE the idea of a vanilla bean for flavoring, and I happen to have some in my kitchen needing to be used. I'm going to make some tomorrow! (It is SO COLD here right now). Yay, let me know how it turns out! It's cold here too--woke up to a good dusting of snow on the ground, but it melted by mid-morning. A pot of simmering applesauce is just the thing to ward off the chill.